Millenials of color will be engaging Boston’s South End in a night of creative expression and celebration. 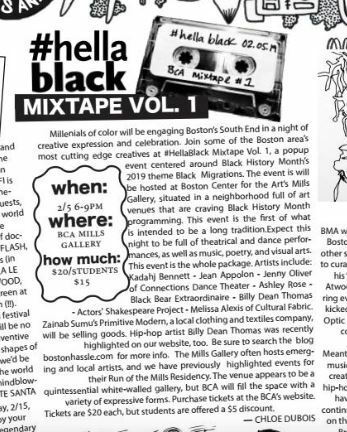 Join some of the Boston area’s most cutting edge creatives at #HellaBlack Mixtape Vol. 1, a popup event centered around Black History Month’s 2019 theme Black Migrations. The event is will be hosted at Boston Center for the Art’s Mills Gallery, situated in a neighborhood full of art venues that are craving Black History Month programming. This event is the first of what is intended to be a long tradition. Kadahj Bennett – Jean Appolon – Jenny Oliver of Connections Dance Theater – Ashley Rose – Black Bear Extraordinaire – Billy Dean Thomas – Actors’ Shakespeare Project – Melissa Alexis of Cultural Fabric. Zainab Sumu’s Primitive Modern, a local clothing and textiles company, will be selling goods. Hip-hop artist Billy Dean Thomas was recently highlighted on our website, too. Be sure to search our blog for more info. The Mills Gallery often hosts emerging and local artists, and we have previously highlighted events for their Run of the Mills Residency. The venue appears to be a quintessential white-walled gallery, but BCA will fill the space with a variety of expressive forms. Purchase tickets at the BCA’s website. Tickets are $20 each, but students are offered a $5 discount.